Welcome to the HIPS PBF Study! The presence or absence of purple basal foliage, or pbf, was not much mentioned in the old literature, so we rely on observation and lists to know which irises possess it. To that end, we want to collect more information about pbf in irises of all ages, since the irises that are introduced today will be considered historic in 30 years. 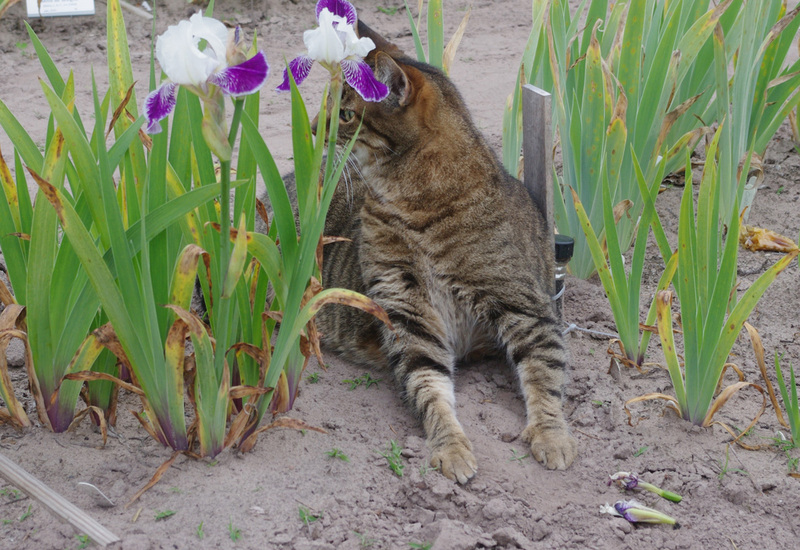 Although we use the general term pbf, we are studying all instances of purple appearing on any part of the iris that is normally green, or for that matter, on the rhizome itself. In other words, if it’s not part of the flower and it’s purple-ish, we want to know. The photo at right shows pbf at the base of the fans, and also as purplish streaks on the fan at far right. Some pbf is lighter, more of a lavender flush. It’s still purple, just not as dark. 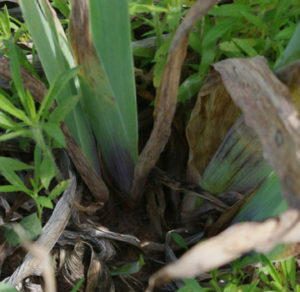 Pbf and related color varies in some irises with the season. It may also vary with temperature, water, soil pH, and other factors. We’re not sure. Therefore, if you choose to participate in our study, please give us a general idea of the conditions in your garden. Please download and use our data template or make your own chart that captures the same information. Record pbf data on as many or as few irises as you wish. If you can’t gather complete data for each variety, please send us the information you can get—all is welcome. As information comes in, we’ll construct a chart that you can view online, with all the data gathered so far. You may also wish to look at our two existing documents about pbf, just to get you started. It’s extremely important that the data gathered is about irises with known identities, so make sure of the ID before gathering data on an iris. Right: Buster the Cat among the pbf. Note that ‘Mrs. Andrist’ at left has strong pbf, while the iris at right has just a flush. Click the photo to see a larger version.